The American DJ Quad Phase Go is a rechargeable lithium battery powered Moonflower effect that offers the creativity of RGBW color mixing offering pure lighting excitement, plus the freedom to set up your fixture where ever you wish without the restrictions of power. The built-in battery will keep a charge for up to 8 hours (full on) from a full, single charge. This fixture uses LEDs rated at 50,000 hours with a maximum power draw of 60W. DMX addressing may also be changed by the unit’s 4-button LED display, or controlled by a DMX Controller or the ADJ UC3 Series controllers. There is no duty cycle on the Quad Phase GO. 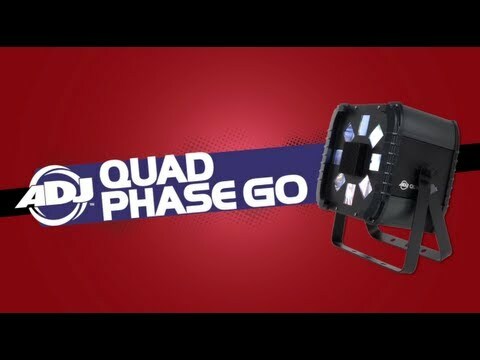 Considering purchasing the American DJ Quad Phase Go? Have questions? Ask people who've recently bought one. Do you own the American DJ Quad Phase Go? Why not write a review based on your experience with it. Seen a video for American DJ Quad Phase Go online or have you own video? 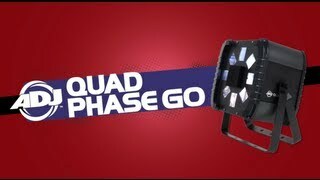 Check out American DJ Quad Phase Go on DJkit.com!